Keeping in mind the scarcity of water in the city and the need to send a social message to the citizens about saving water on account of World Water Day, Incubex Nestavera, a leading Co-working spaces celebrated holistic Holi this year by promoting a dry Holi celebration at its office. The employees of the company used dry organic colours to mark the celebration of the festival. 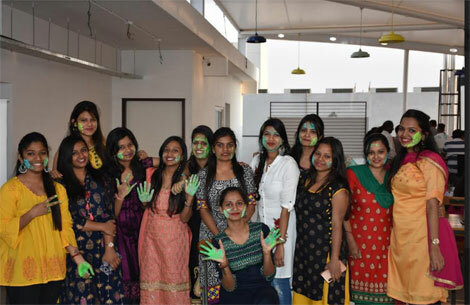 The employees further stepped up to participate in a fun activity by creating a visual representation of their coloured hands on a fabric, leaving a meaningful message of celebrating dry Holi by limiting the use of water. Typically, Holi is about colours, feasting on mithai and having a water balloon fight with friends. However, owing to the shortage of water and extreme rise in mercury, several government agencies and environmental activists have been urging people to reduce their water consumption. While some say that the conservation of water is a social responsibility, not only an environmental issue, others say that Holi is not about using lots of water and chemical colours, it’s about meeting friends and family. Incubex NestaVera believes that small steps such as these can play a greater in environmental conservation. Water crisis is a rising issue in the country and thus it is important for the citizens to stand up and join hands during such times and avoid wastage of water.